There is simply no thing as a bad view from the historic Roundhouse Restaurant. No matter whether you hike up Baldy to ‘earn’ your lunch, or allow the picturesque gondola to whisk you up the mountain for delicious food and some exploring fun, this is a quintessential Sun Valley summer experience. Built in 1939, it has since served as a special spot for lunch and dinner, après ski, and as a charming respite from a busy day on the mountain. As you enter the cozy wooden building, expansive views through large plate glass windows pop into view. The jutting peaks of the Pioneer mountain range rise to the south with majestic Hyndman Peak in full view. The White Clouds and Boulders cut into the clouds north and east. Simply put, it’s awesome in the truest sense of the word. In the summer, you can grab a table on Roundhouse’s expansive deck and soak it all in while enjoying some pretty delicious fare. Expect to enjoy a variety of tasty sandwiches, salads, specials, and a full bar. This year, the Roundhouse reopens for the season on June 23 and can be accessed with a lift pass on the gondola (appropriate for all ages and fitness levels) or by foot (appropriate for experienced hikers armed with the proper shoes, lots of water, and sunscreen). Gondola service is available to download no matter how you get there. It truly is a can’t-miss Sun Valley experience. 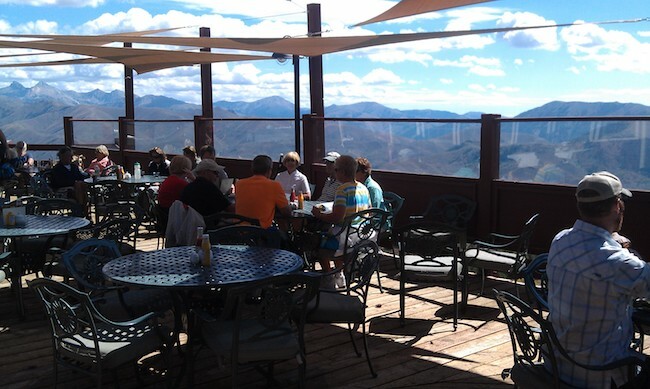 Dining at 7,700 feet above sea level is something that shouldn’t be missed. The Roundhouse welcomes you this summer for lunch with a view! Dining on the large patio of the beautiful Ram Restaurant during the warm weather months is an indulgence worth indulging in. Take a seat at your table, bedecked with white tablecloths, sparkling stemware, and shining silver, take a deep breath, and take it all in. The flowers surrounding the Ram patio are a cornucopia of gorgeous colors and varieties and their sheer abundance is noteworthy. Beyond the flowers, views of Baldy draw the eye out over the swan pond, green lawns, and charming Village architecture. The setting is welcoming and relaxing: the food sublime! The Ram is known for a few things – nightly Heritage dinner specials that recreate favorite meals from the eatery’s storied past, fondue (of course), but also seasonal, regional fare that will delight foodies’ palates. Begin with sea scallops, beef tartare, or shishito pepper and cauliflower. Move on to a second course of artisanal salads before the main event: Idaho Ruby Trout, Lamb Shanks, Angus Ribeye … the choices are plentiful. Be sure to order a specialty cocktail to begin your night and an excellent bottle of wine to accompany your meal. Finally, save room for dessert – they are pretty amazing. During your culinary escape, you will also be serenaded by live piano music – setting just the right tone. The Ram is open from 5:30 – 9:30 p.m. daily and is the perfect spot for pre or post-concert or Sun Valley Summer Symphony dining, as well as special occasions, romantic meals, or just because. Secure your reservation by calling 208-622-2225. It’s hard to decide the best part of dining at the Ram – the delicious food? The spacious terrace surrounded by flowers? The views? Maybe all of the above. More fine dining awaits at the Sun Valley Lodge’s flagship restaurant: Gretchen’s. Located conveniently in the Lodge lobby, Gretchen’s is open daily from 7 a.m. to 9 p.m. for breakfast, lunch, or dinner. But this is far from a typical lobby coffee shop or restaurant. Under the meticulous eye of Chef Derek Gallegos, meals at Gretchen’s, from a simple breakfast to a to decadent dinner, are an experience for the eyes, nose, and, of course, the stomach! Chef Gallegos focuses relentlessly on utilizing seasonal, sustainable, regional ingredients at the height of freshness so, at Gretchen’s, you will get a true taste of Idaho. Care is taken in the kitchen to never cut corners. If it can be done in-house, it is. What makes Gretchen’s even more inviting in the summer months is a patio that stretches behind the Lodge as far as the eye can see. The covered deck is surrounded by copious, colorful flowers and overlooks Sun Valley’s iconic outdoor skating rink. If you dine outside nearly any time of the day, your meal becomes dinner (or lunch) and show as you can enjoy your delicious food all while watching both amateurs and pros practice their spins and jumps on this famous piece of ice. Often around lunchtime, the amazing skaters from Sun Valley on Ice (the resort’s renown Saturday night summer ice shows) have their daily show rehearsals. You can watch members of the corps, soloists, and even the week’s headliners (the superstars of the skating world) warm up, practice their programs, and work on choreography in this amazing setting. It might inspire you to rent some skates and get out there during one of the day’s numerous general admission sessions! To reserve your table at Gretchens, please call 208-622-2144. Breakfast is served 7 a.m. to 11 a.m., lunch 11 a.m. to 3 p.m., and dinner 5 p.m. to 9 p.m. It is another great choice for a meal on Symphony or concert nights as the Lodge is about a two-minute walk from the Pavilion. The Elkhorn Clubhouse Grille is a gem of a restaurant, located away from summer mayhem -- a refuge of good food, good views, and tranquility. Perched on the Elkhorn Golf Course with views over Dollar Mountain and the greens, the restaurant serves lunch and an early dinner with some terrific weekly specials. On Monday nights, take the whole family to enjoy the best deal in town: $5 burgers. Both the Classic Burger and House Burger are $5 and served with homemade potato chips (but you can substitute fries for a small upcharge). Three other burgers are also available at amazing prices: an elk burger, a veggie burger, and a spicy hamburger. Enjoy this meal on the spacious deck -- it’s like a backyard barbecue with better food and none of the work! Then, on Friday nights, come back to Elkhorn Grille for their famous Friday Night Fish Fry. This meal is an all-you-can-eat extravaganza of battered cod and fries for … wait for it … $12. The menu also offers delicious salads and other specialty seafood items like clam chowder and shrimp cocktails. Yum! Round things out with a full bar and you have the perfect start to your weekend! Elkhorn Grille’s regular menu is pretty great, too. I highly recommend the crab cakes and po’ boy sandwich! The Sun Valley Clubhouse is like having your own private exclusive golf club dining room without any of those pesky membership dues (the same is true for the adjacent world-class golf!). 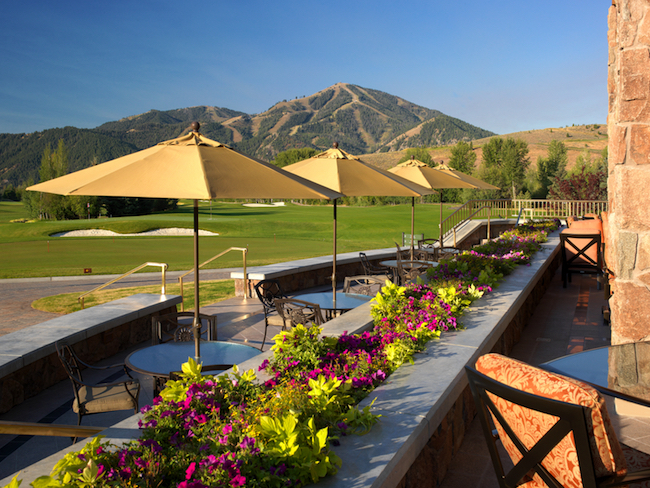 In the summer, the wraparound terrace overlooking Dollar Mountain, Baldy, and the Sawtooth Putting Course, is the place to be. And the food is as excellent as the ambiance. Open daily from 11 a.m. to 7 p.m., the Clubhouse invites you to sit back, relax, and choose from starters like shrimp cocktails and chicken wings, a large selection of salads including the perennial favorite crab or shrimp Clubhouse Louis and a large selection of sandwiches and classic entrees. There is also a special kids menu including cheeseburgers, grilled cheese sandwiches, chicken tenders, and a junior club. And if your children are anything like mine, they will love the terrace because they can go run around on the perimeter until their food arrives! A special bar menu is served daily from 3 p.m. to 4:30 p.m. and includes flatbreads, salads, and sandwiches. You can also get a cocktail or glass or wine until 7 p.m. Here, the food and atmosphere are definitely above par! The Konditorei in the Sun Valley Village is modeled on an authentic Bavarian restaurant and bakery and is a delightful place for breakfast, lunch, and an unbelievable Sunday brunch (think Bloody Marys for two including a skewer of grilled cheese!). 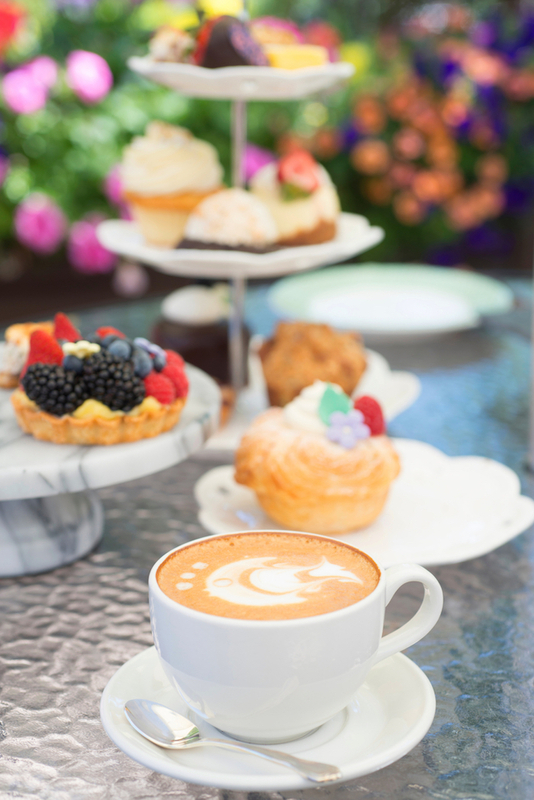 In the summer, you can enjoy breakfast and lunch favorites, a pastry, specialty coffee, or brunch on the patio, surrounded by a burbling stream, more of Sun Valley’s eye popping flowers, and great people watching. Everything at the Konditorei is done with care, from their housemade English muffins, biscuits, pastries, and beautiful desserts, to their emphasis on sustainability and dininggreen.com. Pop in for a treat or stay and linger over a meal. You will be happy you did. 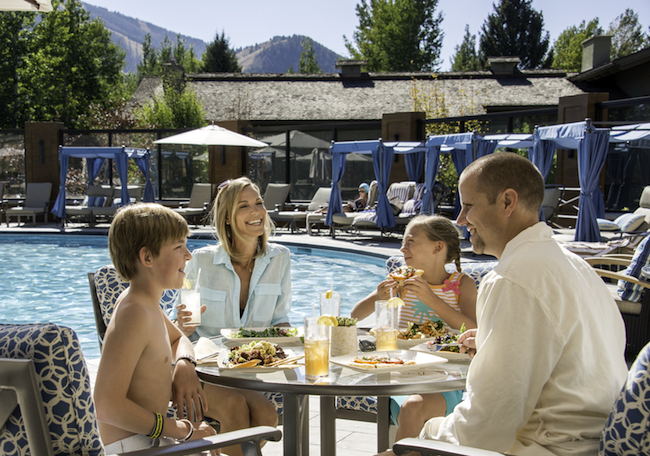 If you are a guest at the Sun Valley Resort, chances are you’re probably spending some quality time at the iconic outdoor Lodge Pool or the glorious Spa at Sun Valley (or both), and, conveniently, there is a terrific place to grab a meal with spectacular views adjacent to both. The Poolside Café is bright and airy and serves food from 11:30 a.m. to 6 p.m. every day both in the restaurant and on the pool deck. No matter where you choose to nosh, the views of Baldy, bluebird skies, and bright blue water simply scream summer. The food is fun, ranging from Norteno Nachos to light tempura of green beans; from a cheese and fruit plate to pork carnitas quesadillas. The Poolside Café is also known for specialty, hand-crafted cocktails. Relax with a “Spa Day” – a combination of Poolside white wine, Warfield Mayday Vodka, Triple Sec, Fresh Pear and Cucumbers on the rocks, or a PBC Margarita – Sauza Hornitos Reposado tequila, Cointreau and fresh lime juice to name just a few. The restaurant is also open to the public so even if you’re not staying at the Resort, be sure to pop in and check it out. Another bonus of dining at the Poolside Café? If you spend $25 you can enjoy the pool and spa facilities for free that same day. You will feel refreshed, well fed, and completely on vacation just by being there. Summer just wouldn’t be summer in Sun Valley without liquid libations to help celebrate occasions large and small. Had an epic mountain bike day on Baldy? Toast your success! Lost an entire afternoon reading that book that’s been on your bedside table for months? Toast that, too! It’s easy to raise a glass during great happy hours and special events at the resort. The Village Station is the newest spot on Sun Valley’s restaurant scene and in addition to delicious Italian-inspired fare, it is also the best happy hour in town. Belly up to the expansive bar in the welcoming train station inspired restaurant and let the bartenders work their magic. During the summer, the patio is also open, allowing you to sip while people watching in the Village. A daily happy hour from 3 – 5 p.m. will start your evening on the right note with $5 draft wines, $5 beers, $5 Epsolon margaritas, an $8 all-American burger, and half-off appetizers. Happy, indeed! The Duchin Lounge is to Sun Valley Resort as fireworks are to the Fourth of July – you can’t really imagine one without the other. The Duchin has been the place to gather, relax, and raise a toast in Sun Valley for 80 years (thought the current incarnation of this historic room was completely reimagined with the recent Lodge renovation). 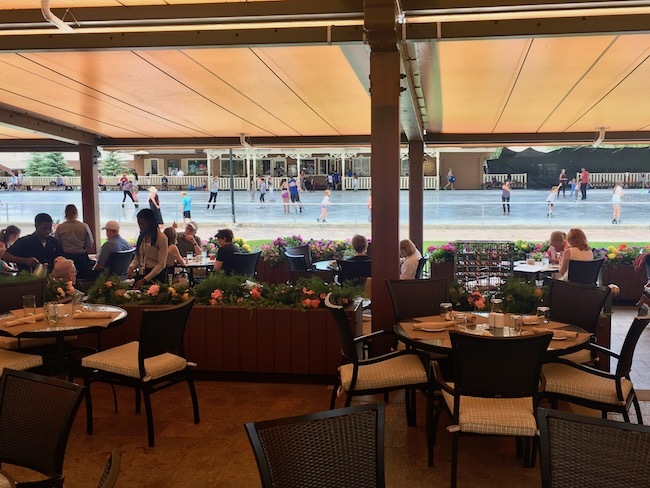 It remains the place to be, whether you choose to order at the beautiful bar, in the comfortable lounge, or on the chic outdoor patio overlooking the Sun Valley outdoor ice rink. It’s always a happy hour at the Duchin but in June, it’s even happier. Every Wednesday this month, join regional winemakers to celebrate Idaho wine. Tastings will be held from 4 – 6 p.m. and include meeting winemakers and tasting three to five varietals for $5 with bottles available for purchase. On June 20th Koenig Winery will be represented and on June 27th meet the folks from Split Rail Winery. 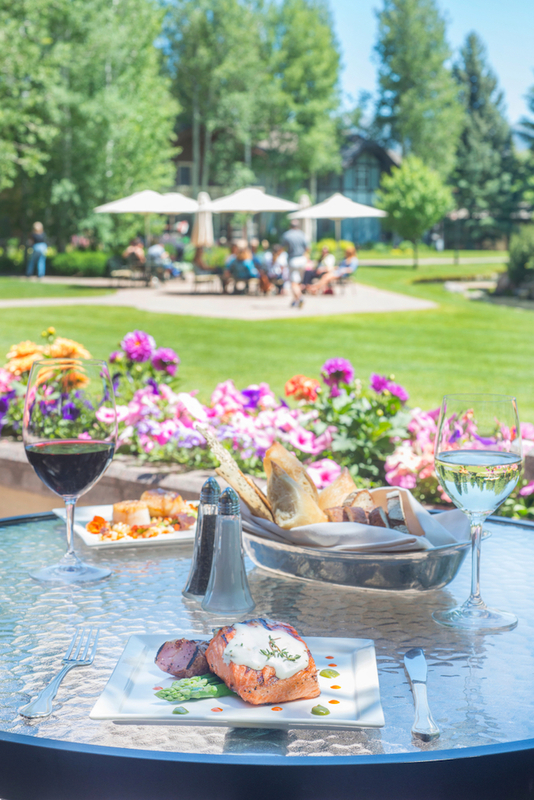 It’s summer in Sun Valley – so eat, drink, and be merry!